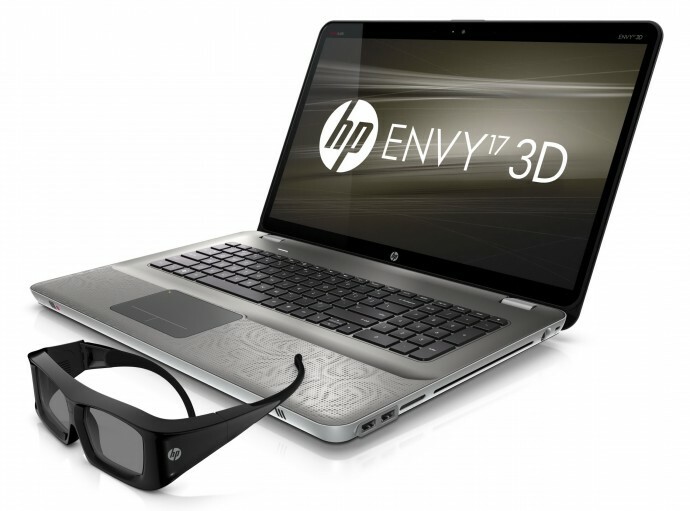 I’m starting with the HP Envy 17 3D laptop that uses a pair of glasses based on the Xpand X103 universal 3D glasses. You should have in mind however that the pair that you get with the HP laptop and extra pairs specially designed for it are only compatible with the laptop as you don’t have an option to switch the glasses to another mode so that they may work with other 3D-capable devices such as 3D HDTV. So if you plan to buy extra pair of active shutter glasses besides the one you get bundled with the laptop, you better go directly for a pair of Xpand X103 universal 3D glasses as they are perfectly compatible with the HP Envy 17 3D laptop, but will also work with pretty much any other major brand making 3D HDTVs that use infrared communication with their glasses. If you happen to own a Sony Vaio F Series 3D laptop, then you’ve got the device with a pair of Sony’s active shutter glasses that is essentially the same as what the company uses with their range of 3D HDTVs. That simply means you can use the 3D glasses you got with the laptop with a Sony 3D HDTV without anything special required and also if you happen to own a Sony 3D HDTV you can use the glasses from the TV with the laptop. This is a good solution if you happen to own different 3D-capable Sony products or plan to have such, but what if you have another brand of 3D TV and you are considering to buy an extra pair of shutter glasses? Here you have the option again to go for the Xpand X103 universal 3D glasses that will support the Sony Vaio F Series 3D laptop as well as any 3D HDTV, Sony included of course, but you are not limited only to them. 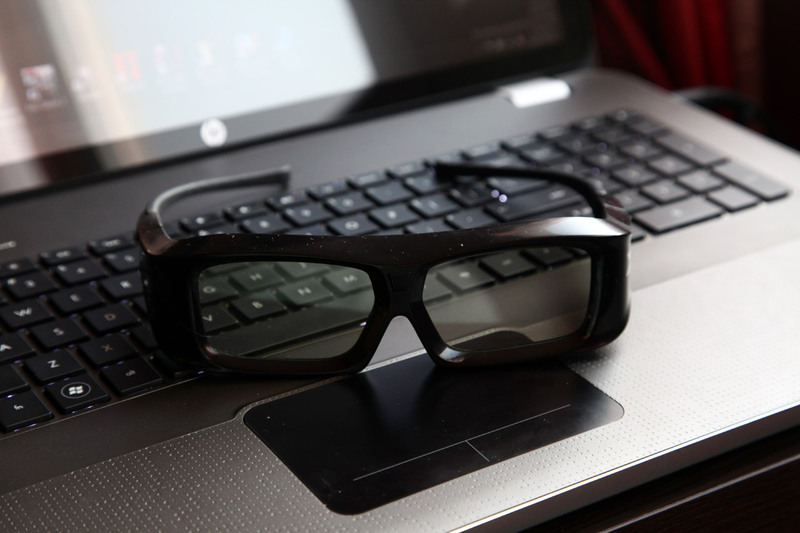 You can pretty much get any universal pair of active shutter glasses that works with Sony 3D HDTVs and it should be able to work pretty much the same way with the 3D laptop. So I disassembled the X103HP glasses to see if they will have traces left for soldering a power button and a SMD LED indicator, but unfortunately I could not find such to be very apparent. So I’ve taken shots of both sides of the shutters and electronics in the X103HP glasses, so that I might be able to compare them at a later time when I may be able to get a pair of X103 universal glasses to compare. But if you do have a pair of Xpand X103 universal glasses and are not afraid to take them apart and take some photos, you are welcome to share the photos here. Although I doubt that a simple modification would be possible to HP’s glasses… It would’ve been nice if HP has decided to go for the more functional universal glasses that would also work with 3D HDTVs, so that they would save you from buying one more pair of glasses if you decide to also get a 3D-capable television set. I know I’m a bit late with this review, but I just wanted to wait a bit more to see if some of the possible issues related to software 3D functionality can be resolved soon after the release of the HP Envy 17 3D Laptop. As well as get familiar with the product and the hardware and of course the specific things related to the new HD3D technology from AMD and the use of shutter glasses together with a 120Hz LCD screen. So here it is, the review of the first laptop using the AMD’s HD3D Technology, with an AMD-based GPU and DDD TriDef 3D software, a mobile computer that is already available on the market – HP Envy 17 3D, in the last day of this year. As usual with the hardware reviews here, the focus will be mostly on the stereo 3D capabilities and performance of the laptop, but if you have questions about things not covered in the review, do ask them as I will probably be able to answer them too. The above specifications are for the model of the HP Envy 17 3D laptop I’ve had for review, it is an earlier sample, but besides the processor the rest is pretty much the same in the final models available on the market now. The test unit was with a dual core Intel Core i5 processor with HyperThreading (4 logical cores) and the models available for sale do come with Core i7 processors, but that should not make that much of a difference for when playing games in stereo 3D mode. Also I’ve got the laptop with the extended 9-cell battery and not with the standard 6-cell one, I’d recommend the 9-cell not only because of the extended battery life you get, but also because it sticks out a bit of the chassis and thus brings the back higher than the front. This makes the laptop stay at a little angle and this is more comfortable position for use and not to mention that it also helps get better airflow and thus improves the cooling of the hardware. Before going into discussing and testing the stereo 3D capabilities and performance of the laptop, I just want to share a few thoughts about the HP Envy 17 3D as a whole. The laptop comes with stylish and clean design, full metal chassis for extra protection and strength, very nice LED-backlit screen, very comfortable full format keyboard with a useful backlight for the keys, good extension functionality thanks to multiple ports for external devices. In general the laptop leaves very good first impression and is really well designed and built to offer a lot of features, flexibility and performance and then after that comes the stereoscopic 3D support on top of everything else. And that last thing is very important, especially in order not to get the wrong impression about the laptop in general after seeing some performance results and the tests in S3D mode below. I should note that the left side of the chassis gets hotter while the right remains cold, although when using the laptop it quite is OK. And when you are going to play games in it you may feel it a bit uncomfortable if you rest your hand’s palm there. The laptop is not overheating though, so you don’t have to worry about that. One thing that may help you get better results is to enable the option from the BIOS to have the cooling fan always on enabled, this should keep the chassis cooler when the systems is not under heavy load too. The function keys of the laptop that are combined with the F1-F10 are by default active, in BIOS you can change the F-buttons functionality to be active by default instead and the Fn button to activate the special functionality of these buttons which is more common and can help you avoid mistakes. The backlight of the keyboard is great for when playing in stereo 3D mode in a darkened room, so you can clearly see the markings of the buttons. Also the touchpad is a bit hard to get used at first, because the whole surface is touch sensitive (including the left/right buttons) as well as the function to disable the touchpad functionality. When you are moving the cursor and at the same time try to press the left or right button your cursor may move out its place due to the pad reacting to this as a movement. But as I said it just takes time to get used to that difference as compared to most other traditional touchpads found on other laptops. The laptop’s glossy screen offers quite a high maximum brightness, but being glossy is not such an issue… it may take some time to get used to it if you’ve never before used a glossy screen because of the occasional reflections. Anyway, by following the recommendations for playing games in stereo 3D mode or watching 3D photos or 3D videos you should not have trouble with having reflections. That is because the recommendations are to views stereo 3D content in a darkened room with no other light sources than the laptops’ screen for getting the best possible 3D experience. The laptop has a Full HD screen capable of working with a 120Hz (96Hz and 60Hz too) refresh rate and an AMD Radeon HD 5850 video card, along with a pair of wireless active shutter glasses that are needed for getting the stereo 3D effect. The wireless shutter glasses HP uses are made by Xpand and seem quite good in terms of design and comfort – light, with flexible frames, held firmly over your head, with high light transmittance. However they do not have a button to turn them on/off, they do that automatically, so when not using them you should put them in the storage bag in order to preserve the battery life. After doing some tests measuring the level of light coming from the display with a lux meter of the screen without glasses, the screen with the glasses off and with the glasses on I’ve found some interesting results. Without the glasses the measured light was 20 lux, looking through the glasses, but while they are inactive – 14.5 lux and through the glasses when active – 9.6 lux. So around 25% decrease in brightness level when wearing the glasses, but they are not active, and around 50% decrease when they are actively shuttering, meaning that not only visually, but also in reality these active shutter glasses block much less light as compared to 3D Vision for example. And that fact, combined with an LCD screen that is capable of providing very high brightness levels should mean a very comfortable experience when using the laptop in stereo 3D mode, but let us see if everything is as it should be in theory. 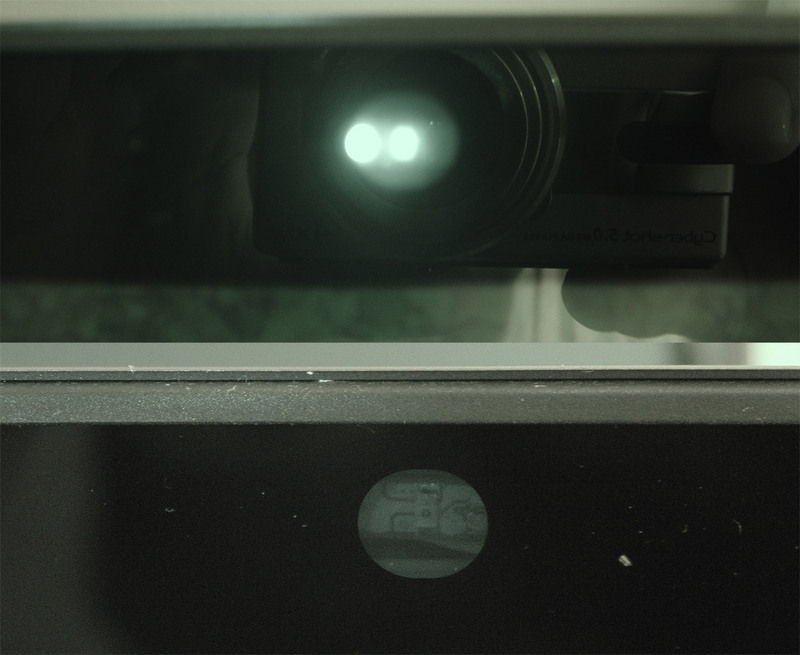 The active shutter glasses that come with the HP Envy 17 3D laptop have their IR sensor at the center of the frames, between the lenses for the two eyes and the IR emitter that sends the synchronization signal to them is built into the laptop’s screen. Actually the laptop has two IR emitters built in the top of the screen’s frame and both of them consist of two infrared LEDs (four in total) that are intended to keep the glasses synchronized (see them on the infrared photo above in on/off state). One interesting thing that I’ve observed testing the laptop in 3D mode was that having a light source behind the screen of the laptop may lead to loosing of the glasses sync signal and thus reverting to them being off. 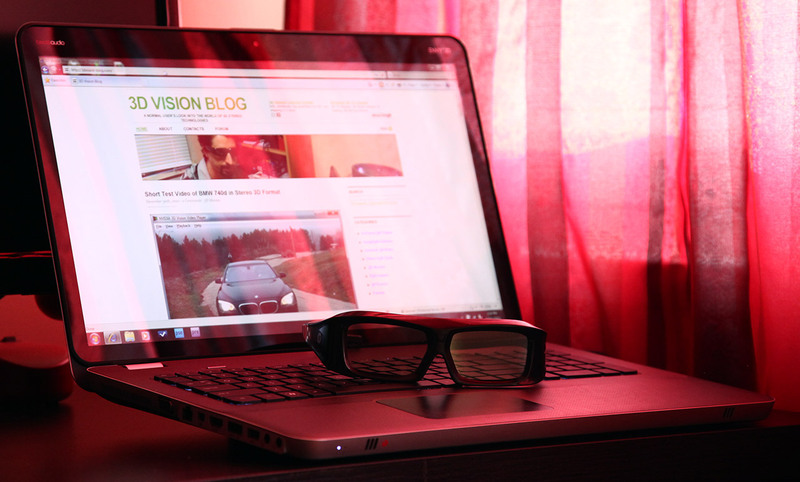 I had such an issue with a plasma TV behind the laptop for example, so if the glasses stop to shutter unexpectedly while the screen is displaying 3D content, then you may also look for an outside issue like a TV somewhere around you or maybe a computer monitor etc. Now lets take a look at how the LCD screen performs in terms of color reproduction and what level of brightness and contrast it offers as these specifications are not being officially announced by laptop manufacturers, unlike when we are talking about a standalone LCD monitor. When talking about a monitor that is cable of being used in stereo 3D mode using shutter glasses these numbers are even more important due to the fact that shutter glasses do block some of the light when in S3D mode and the resulting image appears darker which can sometimes lead to loss of details etc. There were two surprised after measuring the display’s characteristics with a colorimeter, one good and one not so good. I’m starting with the good one which is that the LCD display has surprisingly higher maximum level of brightness of little over than 420 cd/m2. Such a high level of brightness is actually quite hard to find even on desktop displays intended for 3D use let alone on a laptop, but as a side effect of pushing the brightness level quite high, the default accuracy of the color reproduction is quite far from being good. 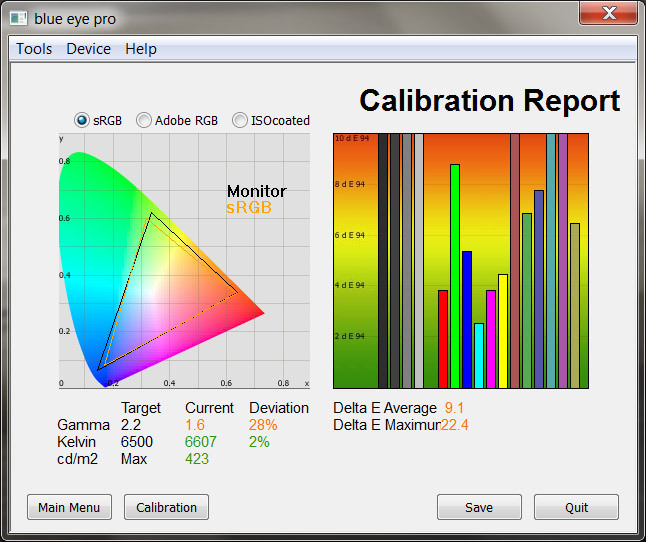 So let us see now what will happen if we calibrate the display for better color accuracy while maintaining the highest possible level of brightness. The reason of doing that is to see what could HP have done in order to get better colors while still maintaining high brightness levels in order to have better results for both 2D use and 3D use of the Envy 17 3D laptop. The results after calibration are really great as not only the color accuracy has improved significantly to a surprisingly good level, but also the loss in maximum brightness is just 65 cd/m2 and the screen can still push really bright image, but with more comfortable and visually pleasant colors. 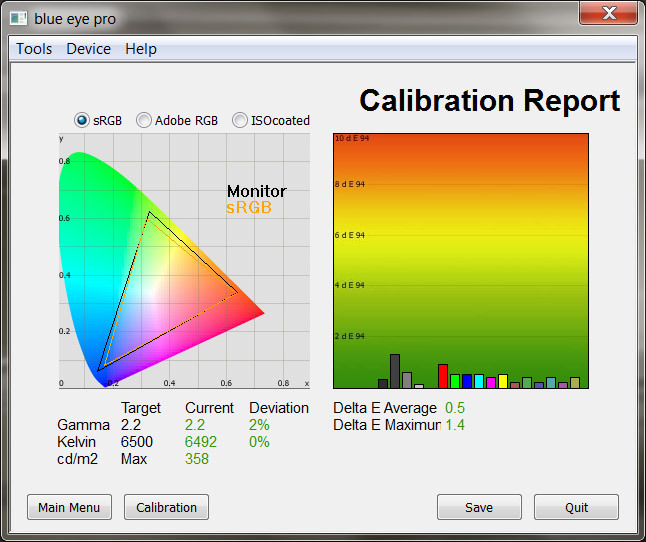 This simply means that calibrating the screen of the Envy 17 3D can make it perform great in 2D in terms of color reproduction, because the display itself is really very good with a average color deviation of just about 0.5 and a maximal one of about 1.4. You should know that the function to control the level of brightness with the special function keys gets disabled in stereo 3D mode and you can’t control it as it is always forced to maximum (~420cd/m2), which is a quite high value and probably this is also responsible for having more ghosting with high contrasting objects as you will see in the test photos below. An interesting thing related to the screen is that when viewing 3D content and you get back to the desktop, you may see the desktop flickering strangely for a few seconds before it gets back to normal… that is if the desktop is set at 60Hz and not at 120Hz mode, if it is set to 120Hz then there is no flicker. This is probably due to some sort of delayed switching of the refresh rate or whatever, but thing is it is kind of annoying, so just switch the default refresh rate to 120Hz to avoid the issue. Time for some crosstalk/ghosting tests in stereo 3D mode. I’m starting with a more recent test photo I’ve made to show the level of ghosting of 3D capable monitors, here you can see more details and get the test 3D photos to compare your screen. 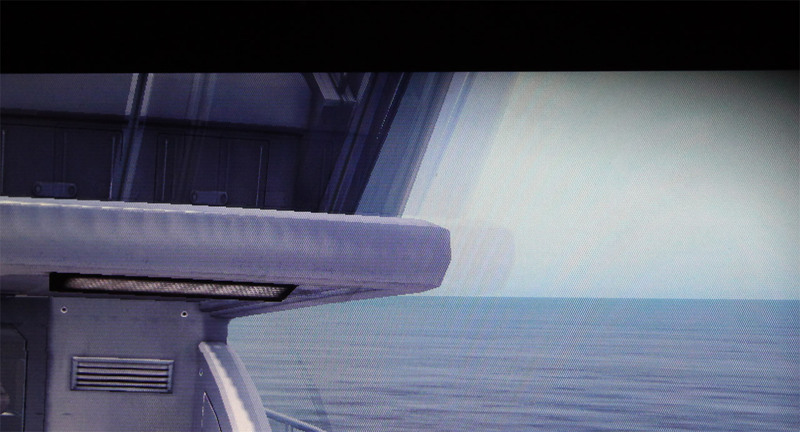 As you can see there is more severe ghosting at the top of the screen, which is expected as it is a common issue for 3D LCD monitors, and the rest is at a pretty low level which is very good. 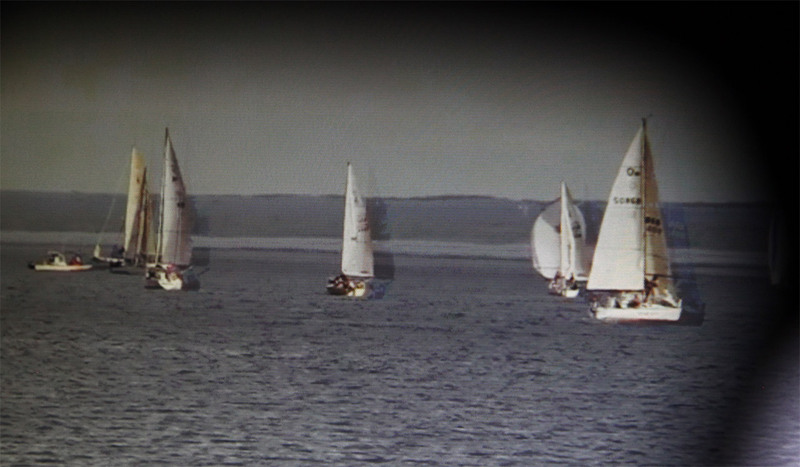 The second ghosting test is the sailboats demo video I’ve been using for quite a while, so you can compare different results with different 3D monitors I’ve already tested to the performance of the one used by HP. As you can see on the photo above, the result is not quite good as there is ghosting in the high contrasting of the bright boats over the darker sea and land and even some color ghosting can be seen. This is clearly a result of pushing for a very high brightness level and I’m sure that with a bit lower brightness level the screen would’ve still performed great, but with much visible less ghosting. And now for some ghosting testing with another of my typical tests, the game Tomb Raider: Underworld. On the image above you can see the top ghosting in action, not that bad, but then again this is not with that high separation as the TriDef 3D Ignition driver used for getting games converted is kind of limiting on that. One more test with Tomb Raider: Underworld, this time emphasizing on the color ghosting that appears when the brightness level is pushed too much and you have active overdrive function to get faster response of the pixels. The end result is a bit annoying when using stereo 3D mode as the crosstalk/ghosting is not only in the form of a slightly visible shadow, but comes in the form of annoying bright colored shadows. Now, before going to game tests in terms of performance of games in stereo 3D mode, lets talk a bit about the use of the laptop for 3D photo and 3D video playback. The HP Envy 17 3D comes bundled with DDD’s TriDef 3D software that is the all in one solution for playing back 3D multimedia content and games in stereo 3D mode. As a part of that software you also get the TriDef 3D Media Player that can open different photo and video files in 3D format as well as do 2D to 3D conversion of videos in real time, but the software does not work for Blu-ray 3D movies. Instead you get as a bundle with the laptop the software HP MediaSmart DVD which is a DVD/Blu-ray player with support for Blu-ray 3D playback, that actually works quite good. 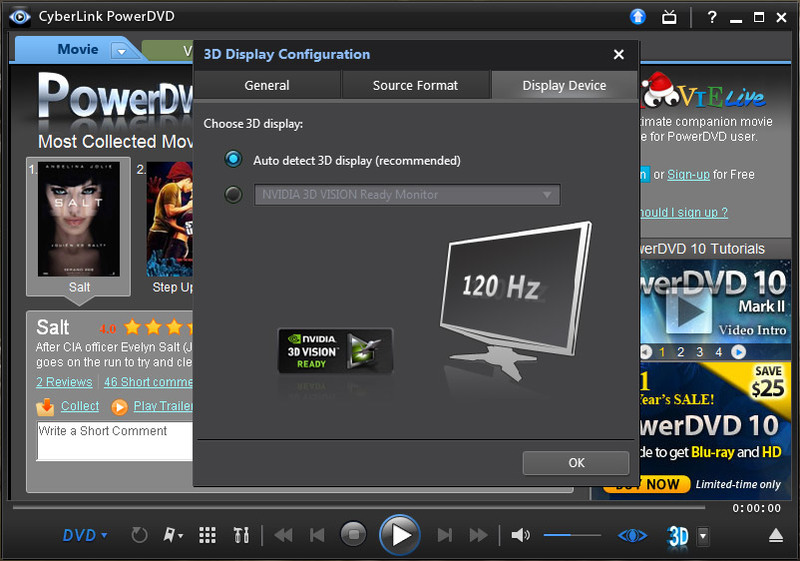 The laptop also works just fine with the latest PowerDVD 10 Ultra trial version, but curiously enough the 3D screen gets detected as 3D Vision capable display. One thing to note is the fact that you get no hardware acceleration from the 5850 GPU when playing Blu-ray 3D movies (only the latest 6000 series of AMD GPUs do support hardware accelerated decoding from the GPU), so the all the load for the decoding goes to the CPU – around 50-55% overall load, meaning the laptop can handle it without problems. The Stereoscopic Player version 1.6.6 does have support for AMD’s HD3D Technology, however it is not yet working correctly with all video files when being played back on the HP Envy 17 3D laptop. Sometimes you can get the player crashing or the video is playing, but the refresh rate of the screen does not match that of the shutter glasses. So for now you should stick with the TriDef Media Player as a general player for watching 3D multimedia content – 3D photos and 3D videos. And you should cope up with the fact that the TriDef Media Player is not so powerful and feature rich as the Stereoscopic Player, however in a future update the Stereoscopic Player may start working flawlessly with the Envy 17 3D too. I should also mention the fact that the HDMI output of the laptop could not be used together with a 3D HDTV for outputting 3D content to a big screen 3D-capable TV at first. And according to AMD this was not supported indeed, but could’ve been added later on with a driver update and with the latest Catalyst 10.12 and TriDef 3D Software 4.4 the support for 3D HDTVs using the HDMI output of the laptop works as I was able to play games and videos on a Panasonic VT20E plasma 3D HDTV. And now finally for some testing with games in stereo 3D mode in order to see what level of performance you can get on the full 1920×1080 resolution using the TriDef 3D Ignition software with 10 popular and mostly more recent games, including some of the heaviest titles that do work nice in S3D. I should note for the people that are new to the TriDef 3D software that the way of running games in normal 3D mode or in stereo 3D is a bit different as opposed to 3D Vision or iZ3D. If you want to play the game normally, then you just run it from the shortcut that it has created when being installed. If you want to play it in stereo 3D mode,then you need to run it through the TriDef Ignition launcher – just drag and drop the shortcut in it and double click on the icon there. The good thing here is that when you play the game in normal 3D mode, then the 3D software is not loaded and does not use any resources, so you get the full performance without having to specifically disable the 3D software. On the other hand it is not as convenient as just pressing a single button at any time to enable the stereo 3D mode while in game, like you can do with iZ3D and 3D Vision. Avatar set to high level of details at 1920×1080 resolution and without AA has managed to provide an average framerate of about 28 fps per eye, something which is almost Ok for a normal gameplay. The game however had a bit more ghosting on the high contrasting areas, especially at the background elements that are far from the character. BioShock 2 did even better that Avatar with an average framerate of of 31 fps per eye at 1920×1080 resolution with details set to high level and again with no AA. The lowest fps was 20, so the game remains quite playable and it also looked very good in stereo 3D mode. Call of Duty: Black Ops did not do flawlessly. The game starts, but when the level loads and is about to start the screen remains black and nothing happens… there is official profile for the game from DDD, but with it or with a generic profile the result is the same, the game did not want to run properly. Civilization V was a big surprise by managing to get just about 20 fps average per eye in stereo 3D mode at 1920×1080 resolution with high details and no AA. The game also ran in S3D mode only in DX9 mode, but with such a low framerate it is far from being comfortable to be played. Dead Rising 2 also ran without problems, but the achieved framerate of just about 21 fps per eye at 1920×1080 resolution with high details and no AA was a bit too little. Just Cause 2 had some issues in stereo 3D mode. There is no official profile for the game and although it runs with generic profile and 3D seems enabled, there was no actual depth visible in the game. Mafia II ran without issues, but as expected it was quite heavy in stereo 3D mode. The laptop managed to get just about 16 fps average per eye at 1920×1080 resolution with high details, no AA and no PhysX. Metro 2033 is one of the heaviest game titles released lately and it was no surprise that the average framerate achieved was around 13 per eye. That was with DX9 mode, 1920×1080 resolution with high details and no AA, as the game does not run in stereo 3D mode when in DX10 or DX11. Tomb Raider: Underworld is one of the games that is not so new, but works great in stereo 3D mode in most cases, as with the TriDef 3D Ignition there are some small issues. The game itself manages to get an average framerate of about 31 fps per eye at a resolution of 1920×1080 with high details and no AA. 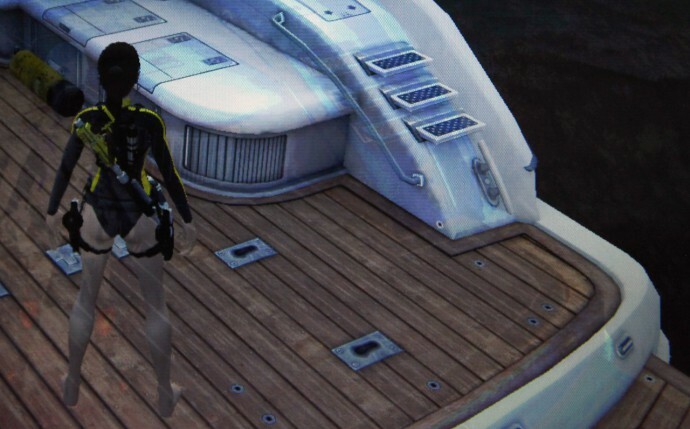 X-blades is another very good looking in stereo 3D game, although being a bit old already. In it the laptop has managed to push the full 60 fps per eye average framerate at 1920×1080 resolution with high details and no AA. The 60 fps per eye framerate is the top limit for 120Hz LCD displays using shutter glasses due to the required use of Vsync. As you can see from the results, the Radeon HD 5850M GPU although being quite powerful for a laptop is still a bit slow for providing comfortable framerates when in stereo 3D mode in more recent and more demanding games in the full 1920×1080 resolution with high details and no AA. You will have to lower the level of details or disable some of the extra visual effects in order to get good framerates, or go to a lower resolution, although that is not something I’d recommend for stereo 3D gaming.